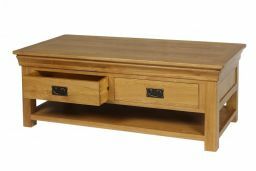 Farmhouse Oak Large Coffee Table with Shelf - A brand new design of coffee table for Top Furniture - 2 Drawers of each side. The farmhouse country oak coffee table with shelf is manufactured from sustainable American oak and is finished with a premium oiled wax which brings out the natural beauty of the American oak. 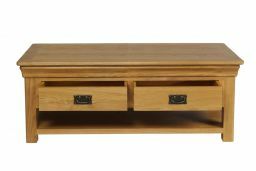 This coffee table is designed with the farmhouse detailing around the edging. 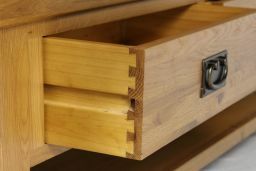 All 4 drawers come with handmade dovetail joints for added strength. Delivered fully assembled and ready to use. 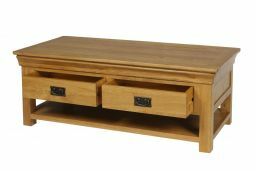 This coffee tables is manufactured as part of our Farmhouse Oak Range. 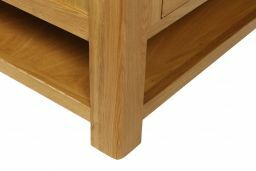 Excellent quality table. Fantastic price. Excellent and friendly customer service. 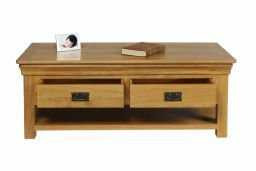 An excellent piece of furniture at a competitive price. Exactly as advertised. Very pleased with with everything except for the inflexibility of delivery time at 7 am! Very pleased with the table. It is how it is described. Would have been helpful if the driver had allowed us to unpack it to inspect first then he could have taken all the packaging away, but he was too.keen to rush off. 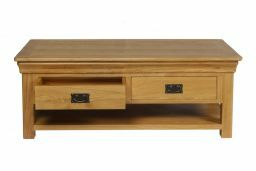 An impressive and weighty piece of furniture at a very attractive price. It's just what we wanted and looks very handsome. The only disappointment is the interior of the four drawers, which is a bit rough, and probably would be improved by drawer liners. But overall it's a very pleasing addition to our television room. 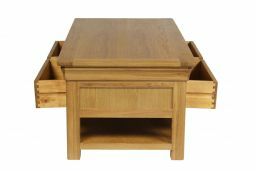 Excellent table,well made and solidly made. Delivery was spot on to, arrived in a few days only. 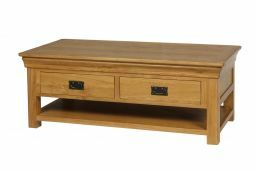 I had a coffee table and console table. They are both beautifully made and look lovey in my room. Lovely coffee table and the staff were so helpful. 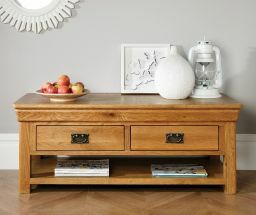 I have bought other pieces from Tops Furniture and all been beautiful pieces of furniture. I can highly recommend this company. 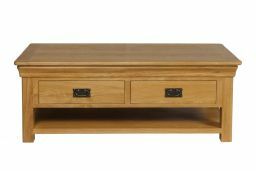 Very nice coffee table,good size and colour,just what I wanted. Beautiful wow great product. Love it. Thank you so much.Well packaged great value. Highly Recommended. Perfect addition to our leaving room. 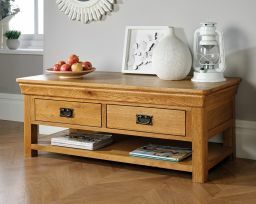 Highly recommend Farmhouse range which is very stylish. 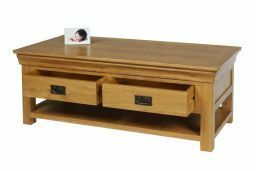 Very sturdy coffee table, delivery was excellent and on time. Thank you. Would certainly recommend to friends and will be returning in the future. 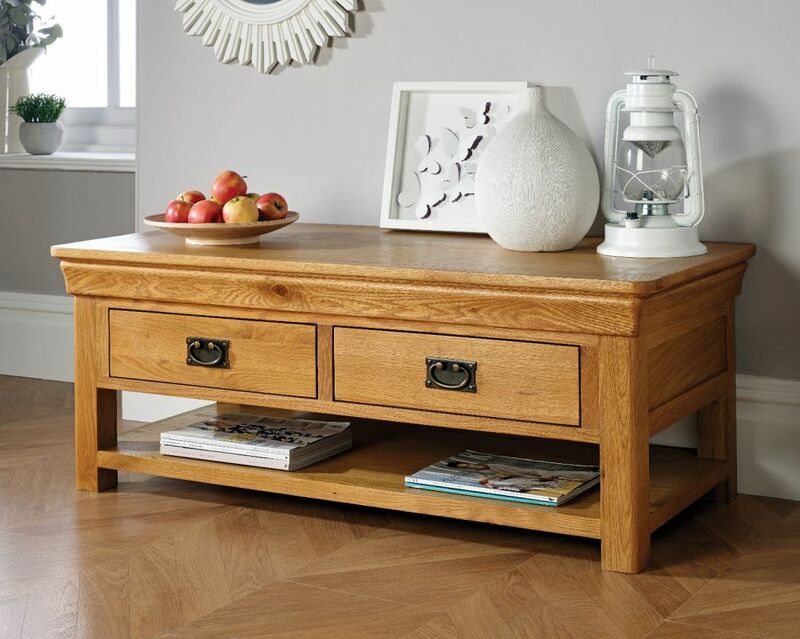 An attractive,well made piece of furniture,competitively priced. Fab coffee table. Excellent quality and just what we wanted We also purchased another 3 items; bookcase, nest of tables and tv unit. All were of exceptional quality and would recommend to anyone. The delivery drivers were also prompt and very helpfull. 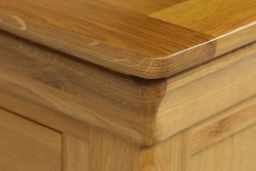 Well made table with a good surface finish.